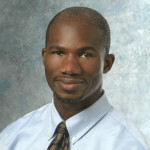 Dr. Ajiboye’s main research interest is in the development and control of brain-computer-interface (BCI) neuroprosthetic technologies for restoring function to individuals who have experienced severely debilitating injuries to the nervous system, such as spinal cord injury and stroke. Currently, he is interested in understanding at a systems level the relationships between the firing patterns of multi-neuronal networks and the kinetic (muscle activity and force) and kinematic (limb position and velocity) outputs of these neural systems in the control of upper-limb movements. The end goal of his research is to develop BCI systems that allow for more natural interactions with one’s surrounding environment, and more natural control of assistive technologies, such as artificial limbs and functional electrical stimulation (FES) based systems. Dr. Ajiboye has received both a junior and senior level Career Development Award from the Department of Veteran’s Affairs. He received his dual BS degree in Biomedical and Electrical Engineering, as well as a minor in Computer Science, from Duke University (Durham, NC) in 2000. He then received his Masters (2003) and Doctoral (2008) degrees from Northwestern University (Evanston, IL).